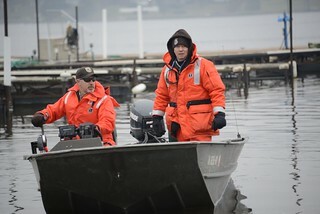 LECLAIRE, Iowa – Salvage, cleanup and environmental protection efforts continue in response to the sunken towboat Stephen L. Colby on the Mississippi River near LeClaire, Iowa, Tuesday. A unified command consisting of the Coast Guard, Iowa Department of Natural Resources, Illinois Environmental Protection Agency and local and industry representatives is working closely with the U.S. Fish and Wildlife Service to prevent wildlife from pollution exposure. The unified command is working in conjunction with the community to ensure the environment is restored to its original state. The response has brought in local, regional and national all-hazard pollution response experts to assist in the efforts. LECLAIRE, IOWA – U.S. Fish and Wildlife Service personnel, Ron Knopik, Assistant Refuge Manager at Port Lousia National Wildlife Refuge and Ed Britton, Refuge Manager Savannah District, Upper Mississippi River National Wildlife and Fish Refuge, perform shoreline assessment and wildlife reconaissance, south of LeClaire, Iowa, Dec. 3, 2013. U.S. Coast Guard photo by Petty Officer 1st Class Mariana O’Leary. The unified command has deployed 3,700-feet of containment boom, 3,480-feet of sorbent boom, four skimmer vessels, five workboats and approximately 160 response personnel responding to the cleanup and salvage operations. Approximately 61,970 gallons of oily-water mixture has been recovered from the river, 88,801 gallons of oily-water mixture recovered from the Stephen L. Colby, and more than 1,800 cubic-feet of oily waste has been collected. As a reminder to the public and mariners a safety zone has been established along the Iowa riverbank extending outward 1,000 feet near Ferry Street to one mile down river near Canal Shore Drive SW, to protect the public and response crews during salvage and cleanup operations. Vessels desiring to transit the safety zone should contact the vessel Marc on VHF-FM radio channel 16 and 9 or call 563-320-5382. The local public is urged not to handle oiled or injured wildlife. Representatives with the U.S. Fish and Wildlife Service are proactively engaged in conducting wildlife protective measures. Click the picture for more from the operation.